Living roofs can provide fresh areas for the local ecology to thrive and, with continued urban expansion absorbing the habitats of our indigenous plants, insect and birds; landscaping flat roofs offers an effective and practical use of space, whilst helping to sustain and replace lost habitats in the process. Bauder has created diverse green roofs such as park land, allotments, japanese gardens and zoological enclosures. We use many recycled and reclaimed materials in the landscaping components of our green roofs, further enhancing the environemental benefits of a Bauder green roof. Creating a natural habitat for flora and fauna – a living roof can create a local ecology in which the vegetation will establish and provide a home for smaller elements of wildlife as well as insects and invertebrates. Aiding biodiversity – the provision of a healthy habitat in a place that could otherwise be empty provides support for the natural colonisation of locally arising plants, birds and small animals, encouraging a wider spread of species in the area. Storm water management – soft landscaping helps to reduce the risk of flood by retaining large proportions of annual rainfall and reducing rainwater run-off. This is particularly useful within Sustainable Urban Drainage (SUDs) schemes. 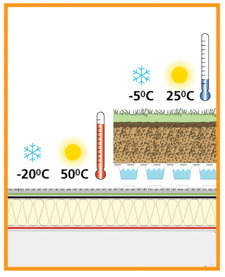 The volume of water retained is dependent upon the depth of substrate utilised in the landscaping, the greater the depth, the more water is held back on the roof. Environmental masking – this assists in blending the building into its surroundings and in part replaces the permeable land surface otherwise lost to the construction. Improved air quality – the vegetation assists in reducing both gaseous pollutants and dust particles by removing a proportion of them from the immediate environment. Additionally, the natural evaporation of water from the plants and soil helps to cool and humidify the air, so lowering the ambient temperature and reducing the heat island effect. Photosynthesis - This is part of a plants’ living process whereby they actively convert carbon dioxide to oxygen. Independent research suggests that, under maximal conditions, each square metre of single leaf surface on an established extensive type planted roof, with a 12 hour day length is estimated to take up (0.3024 x 48) 14.51g of Carbon dioxide and release (0.3024 x 32) 9.68g of oxygen a day. Urban heat island effect is reduced - this is the difference in temperature between urban areas and the surrounding countryside. In large cities, this can be as much as 5°. This happens because large building surfaces will both reflect and radiate solar energy within a built up area, which does not dissipate fully overnight. The substrate of a green roof will absorb some of this heat and the natural evaporation of water from both the plants and the soil helps to cool and humidify the air, thus lowering the ambient temperature. Reduced carbon footprint through lowering building running costs – the thermal insulation on the building is improved providing a more balanced temperature within. This eases heating costs in the winter and air conditioning expenses during the summer. Reduced construction costs – depending on the landscaping selected, the following may be achieved; no requirement for screed on the deck so reducing the overall weight imposed, fewer rainwater outlets, decreased rainwater drainage system capacity and a reduced requirement for storm water attenuation within the SUDs scheme for the site. Increased property value– the roof is an under-utilised development asset, which can be maximised for a number of purposes, including leisure, and offers a unique potential for replacing the land lost to the footprint of the building. Noise reduction for the building – green roofs have excellent acoustic qualities for both external sound (up to 3dB) and internal noise up to 8dB). This can prove to be beneficial when used on structures close to airports or industrial developments. 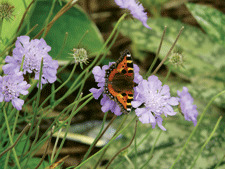 The vegetation on a green roof will encourage small wildlife on to the site. The green roof protects the waterproofing from UV damage and thermal movement.